Engaging with private landowners is more important than ever when it comes to conservation. 71% of land in the lower 48 states is in private ownership, so it’s vital for landowners to understand their land and how to protect it. Successful land conservation requires action and initiative at all levels. State agencies, local communities, and private individuals need the right tools to protect working farms and forests, scenic landscapes, natural areas, wildlife habitat and game lands, historic resources, and parks and recreational areas for present and future generations. Enter Amy Johnson and the Virginia Working Landscapes! Amy Johnson is the program director for Virginia Working Landscapes (VWL), a Smithsonian-led research initiative that encourages the conservation of native biodiversity and sustainable land-use through research, education and community engagement. So how is this accomplished? RESEARCH: The team of scientists at VWL leads on-the-ground habitat monitoring to reveal how land use practices impact wildlife and how biodiversity benefits working landscapes. ENGAGEMENT: VWL works closely with the community through citizen science, education and engagement. 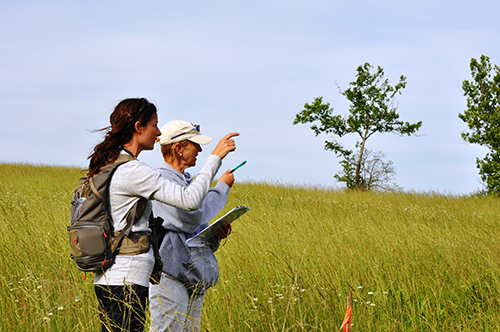 They partner with citizen scientists and landowners to conduct biodiversity surveys on private and public lands and create an information sharing network to promote best practices for conservation. EDUCATION: VWL and the Smithsonian Conservation Biology Institute (SCBI) lead public lectures, seminars, workshops and courses that focus on a wide range of conservation topics. With the Smithsonian-Mason School of Conservation, they support a strong intern and graduate fellow programs as well. As the program director, Johnson develops a network of private landowners, citizen scientists, NGO’s, state agencies and research scientists to collectively research the impacts of conservation management and land use on biodiversity. As a former Smithsonian-Mason Research Fellow, Johnson’s Ph.D. research focused on the impacts of conservation and land management on breeding and over-wintering bird communities in Virginia. Specifically, her research is raising awareness on the importance of bobwhite quail conservation initiatives for conserving habitats for a group of steeply declining species. Through this research she discovered just how necessary private land conservation is. Johnson also used citizen science data to develop an occupancy model for loggerhead shrikes in the southeastern United States. Results of this research are now being used to facilitate state-level population monitoring through citizen-science initiatives. Prior to being awarded the Smithsonian-Mason Ph.D. Fellowship in Conservation Science, Johnson received her bachelor of science in agriculture from the University of Guelph in Ontario, Canada, and a master’s degree from George Mason University, focusing her research on developing assisted reproductive techniques in wolves.